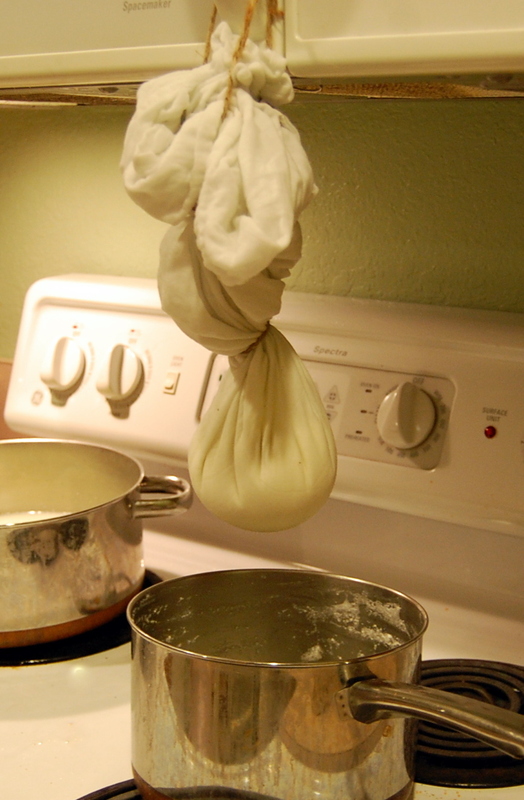 I make homemade yogurt and I save money by doing so. 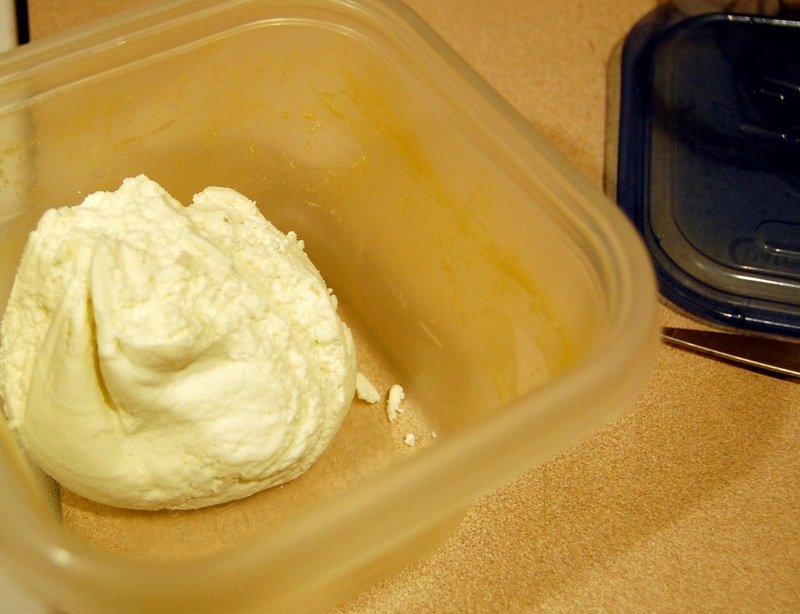 Thus, in my mind, it stood to reason that homemade farmer's cheese would also be cost effective. But that's 8 cups of milk and 2 cups of buttermilk ... so far it's all sounding good. I bravely forged ahead, certain that *my* yield would be more than 1 cup. I'm not sure why I gave myself this much credit, but I did. Milk curdling, straining contraption ready to go in the background. I brought the milk and salt to 180'. I added the buttermilk and vinegar. I stirred. I waited 10 minutes. 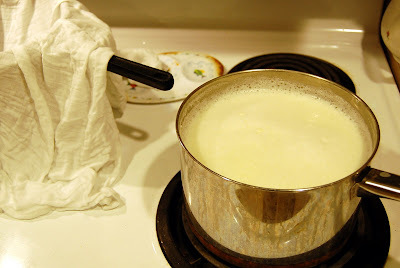 I strained the concoction into an (unused) cloth diaper (because I had no cheesecloth or unused pantyhose - I don't think I've worn pantyhose since I moved to south Florida 18 years ago so even though they are a reasonable substitute for cheese cloth I didn't have any) and a strainer. After straining and squeezing I turned my final product into a container. I rigged the dripping cheese with twine, from the microwave door handle. Looked weird, worked great. This container only holds about 4 cups total. But really, it's about flavor, right? Sure, if you like bland rubber. Me neither. Really, it's flavorless, so it's not all bad, but it's rubbery and just not appealing. I will use it in something, like a casserole or spaghetti sauce, but not by itself. I don't think I'll make this again. But ... I read enough reviews to know that the results aren't always the same, and there are options that might make for better, larger quantities of cheese, so I might give it another try ... probably on one of those days when the milk must be used immediately. If you make farmer's cheese I'd love to hear of your experiences. Please share! So, let's say (hypothetically) that you are making yogurt for the first time, and decide to flavor it with some extremely runny homemade strawberry jam. then, you decide to be uber careful and leave it in your crockpot on low for, oh...hours. And the yogurt completely separates into rubbery bits and strawberry flavored...water. So, you take that mess and strain it. My dear, you would (hypothetically) get strawberry flavored bagel spread. A few little hints from my catastrophes from trying to make this. First I have found you don't need more vinegar, it really won't change the final product. Second, I find when making this that whole milk is a must otherwise it is quite rubbery. Third is if you want the flavor a little closer to "store bought" add some salt to the milk while heating. I don't know about how much I add (I do it to taste, probably about a teaspoon or two). I hope this helps. When I make this I save quite a bit from the conventional store bought and I even spend the extra for organic. I hope this helps you.